Our story begins when Tim and I got married 25 years ago. We were young and really didn’t have money for a honeymoon, so we postponed it for a while. One year turned into another. Then, we had a baby girl, Katherine and 5 years later another girl, Sydney. Our dream vacation always took a back seat! The next journey for me was to finish my college degree. After 2 years, I had my Bachelors Degree in Education. Time went by and after being married for nineteen years, Tim and I finally decided that it was time for a real honeymoon. We decided the Sandals resort in Ochos Rios, Jamaica was the perfect relaxing destination! The two hour bus ride from the airport, seeing the little houses and families along the roadside, was really heartbreaking. In the United States, our house is considered very small with only one bathroom and three bedrooms, but compared to some along the roadway with a roof barely attached, I was feeling very blessed. The resort was beautiful and the Jamaicans were so warm and welcoming! On day two, I asked Tim if we could go visit a school. He said, “Sure, but most people don’t do that on their honeymoon!” The resort scheduled a visit to a primary school. As we drove up, we saw a cinder block building with only missing blocks for the windows. As we toured the school, I realized how happy the students were and that the classes were very large for one teacher. Looking around the classrooms, I realized that the students were using milk caps and soda caps to count with. We take so many things for granted in the US. Our trip ended but within five months, we planned our Thanksgiving holiday to return with 400 pounds of schools supplies. 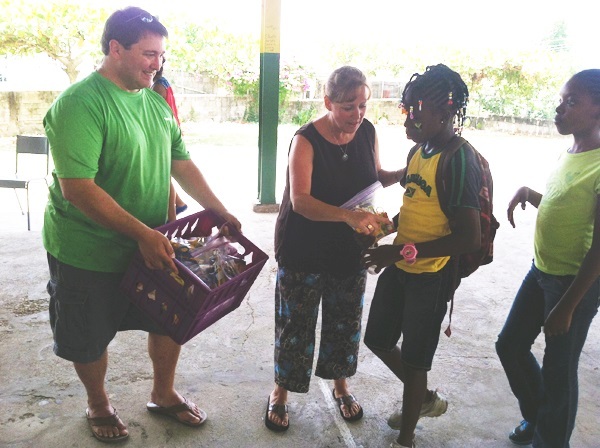 Sandals, once again, really helped us deliver these supplies to the schools. Seven years passed and Tim and I just celebrated our 25th wedding anniversary. It was 3 weeks before my school year started and he surprised me with a trip back to Jamaica. My first thought was, “We don’t have time to get school supplies together!” I didn’t have any contact information with Sandals, so I went straight to the internet! I did a search, “school supplies for Jamaica.” Pack for a Purpose and the Sandals Foundation came up! I was so excited to see the other stories of people that have also taken items to children all around the world! 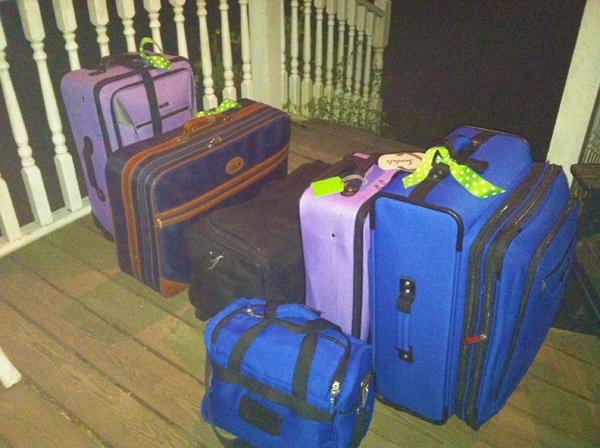 How easy is it to pack a few extra things in your suitcase? Pack for a Purpose notified the Sandals Foundation which gave Tim and me a direct way to make our last minute plans. Lindsay, the Sandals Foundation coordinator in her region, informed us that because it was early August, students wouldn’t be back in session yet. It turned out that July and August are the best time to buy school supplies! 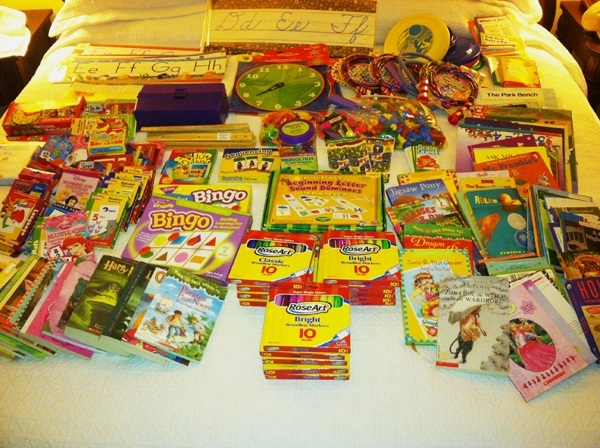 We went around collecting bargains and before we knew it, we had collected 250 pounds of school supplies and books! Yes, we did cut back on how many outfits we took and how many pairs of shoes I packed, but it was easy to see what was more important. We were excited to find out that there was a summer camp and we were able to take some of our packages to the campers and help serve lunch! This really was the highlight of our trip to see the students. They are so smart and cheerful. We passed out about 75 packs of school supplies and the remainder of the supplies went up the to a small mountain town the following week. Would we do this again? Yes! What was the best part? Just seeing how little these children have, but how grateful they are for any small supplies. Do we think about them often? Yes! Every day I send a special prayer not only to children in Jamaica, but to children around the entire world. What was the best part? I can’t explain because it was so magnificent, but to sum this story up….it doesn’t matter how much extra you take with you because EVERY little item is worth so much more than we will EVER know!